If you didn’t live through the drama that was Apollo 13, you’ve probably seen the movie starring Tom Hanks. And even though the mission never made it to the moon, the Apollo 13 astronauts and crew are still considered heroes for getting back to earth safely. So of course they deserve to be immortalized as Lego minifigs. 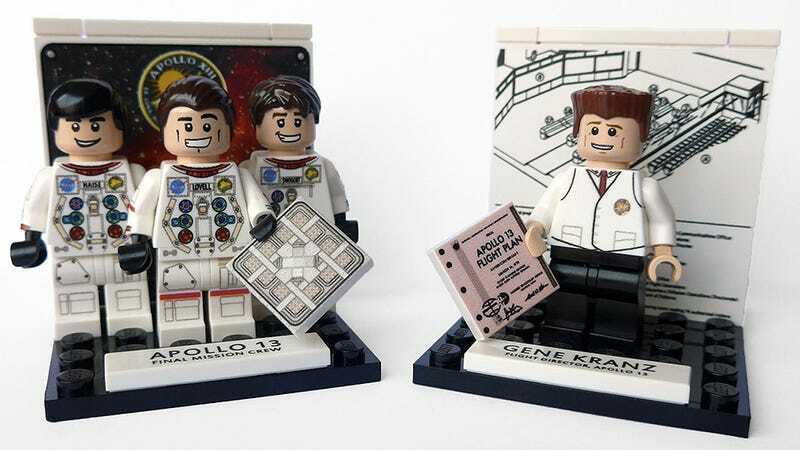 April 10, 2015 was actually the 45th anniversary of the Apollo 13 near-disaster, and to commemorate the occasion UK-based Minifigs.me created tiny Lego versions of the three astronauts involved: James Lovell, Fred Haise, Jack Swigert. But also flight director Gene Kranz who played an important role in getting Apollo 13 home safely. The astronauts are available in a set of three for about $57, or they can be purchased individually for about $20 each. A little pricey, but remember these aren’t officially from Lego. These are custom-made minifigs with highly-accurate spacesuits and likenesses as close to the real astronauts as possible.